Pangkor Island is about a fifth of the size of Penang off Peninsular Malaysia’s west coast, midway between Kuala Lumpur and Penang. 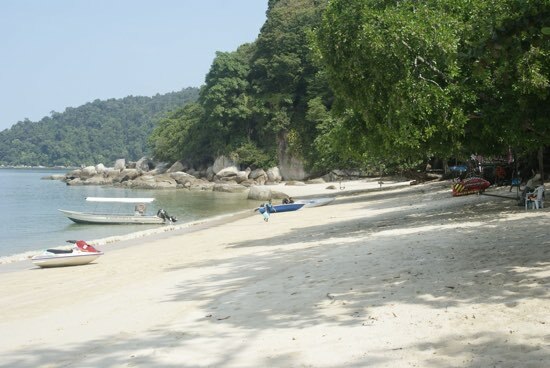 The word Pangkor is said to be a derivative of the Thai “pang koh”, which means beautiful island – and yes, this gives a hint of what the island is like, with sandy shores and surrounding emerald waters. 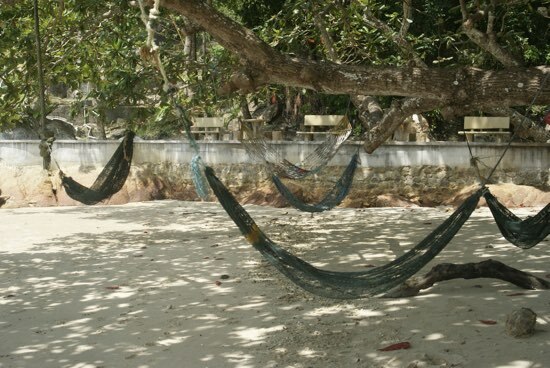 Pangkor is well regarded as a family-oriented and culturally diverse destination, so guesthouses and hotels are generally family friendly rather than party oriented. Long and thin, its main town of Pangkor is on the east coast, while beach accommodation is concentrated along the west coast beaches of Pasir Bogak, Nipah and Coral, which are a short taxi ride from Pangkor town. On ferry arrival, one may be inclined to think the entire island is industrial, as the busy eastern seaside coast is a tapestry of boat building and fishing boats, but the west coast is wide open for beach time. Exclusive, smaller Pulau Pangkor Laut lies off the southwest coast. Pangkor was a haven for fishermen, merchants and the occasional pirate in the days of yore. But Pangkor’s primary claim to fame was being the location of the signing of the significant Treaty of 1874 between the British and the Sultan of Perak. The treaty formalised British control of Perak, for which in return the Brits offered to help settle disagreements and fighting related to Perak’s lucrative tin mines. In practice the agreement strengthened the British tin monopoly and was a stepping stone in the creation and eventual control of the Federated Malay States. Today, despite the island being a popular tourist destination, the local economy relies heavily on the sea, with the fishing and boat building industries well established along Pangkor’s eastern coast. From northern Sungai Pinang Kecil to southern Teluk Gedung, quaint stilted wooden houses dot the waterfronts, along with a few industrial eyesores, making for quite the busy little seafront. Sandwiched between the bustling seaports and the stretches of sandy shorelines, densely forested hills overlook the Pangkor community and are a welcome sight for nature lovers. The Forestry Department overseas three forest reserves, but being the low man on the financial totem pole has made it difficult for proper maintenance of any visitor centre or nature trails. The forests are still quite picturesque however and are known for their diverse flora and fauna, serving as a balance to the more industrial and developed parts of Pangkor. We hope the jungles will continue to be protected from developers. Plenty of space for everyone. The sandy shores and emerald waters alone are attractive options for beachgoers seeking a generally quieter tropical island scene. And although two of the more pristine beaches are attached to presently closed resorts, the public beaches won’t disappoint. 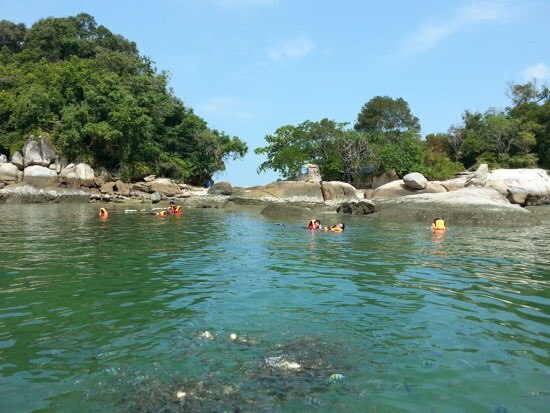 Pulau Pangkor has a dense forest interior with a busy seaport on the east side of the island and uncrowded sandy beaches on the west. The main jetty at Pangkor town is on the east coast and is a good landmark for new arrivals as anything that you might need will be within short walking distance. Just to the north are two banks with ATMs, several sundry shops and a tourism office. Pangkor town is also home to the police station and medical services. English is widely spoken and understood, with most locals being quite helpful in pointing the way. 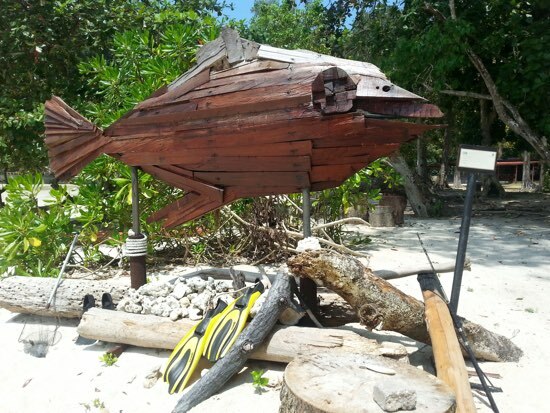 The famous Pangkorian driftwood fish. Upon arrival you’ll be able to grab a taxi quickly as the lilac-pink minivans hang around at the jetty’s adjacent parking lot. A 10- to 15-minute taxi journey across island – to popular Pasir Bogak beach or the Nipah beach areas – should be around 15 ringgit; a fare guide sign is posted at the taxi stand. 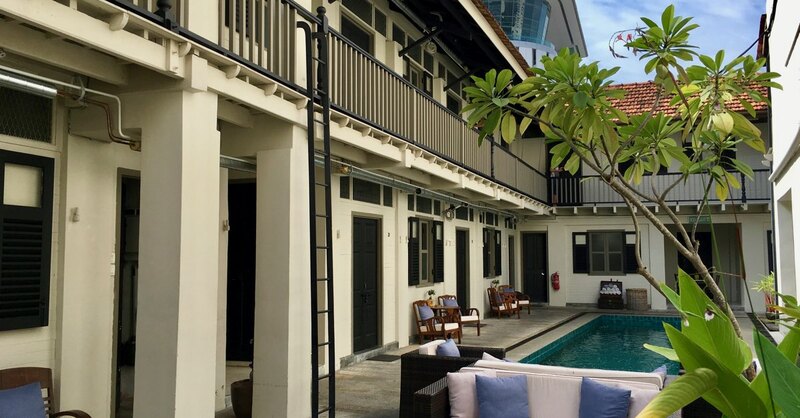 Nipah and Bogak beaches have an extensive choice of guesthouses and hotels to accommodate all budgets, as well as non-seaside options closer to Pangkor town. The Tourist Information Centre on Jalan Besar in Pangkor town is open daily and they have English-speaking staff and informative maps of the area. The maps may appear too simple, but what you see is what you get. A couple of main roads and a few notable landmarks will keep you from getting lost. Pangkor’s main road Jalan Besar turns onto Jalan Pasir Bogak at the edge of town and crosses the island from east to west and generally hugs the coastline from southwest Pasir Bogak Beach to the northern end of Coral Bay. Here dense forest reserve takes over until you reach the now closed airport at Teluk Delam Bay at the north end of the island. A small restaurant is located at the T-junction to refuel or grab a cold beverage. The main road continues onward and literally upward from northwest to northeast as this end of Pangkor is engulfed with massive trees and more dense forest. The road snakes through hairpin turns and eventually descends along the eastern coastline to Teluk Cepedak, once again becoming Jalan Besar. The area along the northeast coast heading south towards Jetty Sungai Pinang Kecil and Jetty Sungai Pinang Besar is predominantly populated by a Malaysian Chinese community and is home to the industrial area of Pangkor; here you’ll see with traditional boat building and giant fishing trawlers unloading their catches. It’s not the cleanest or quietest part of Pangkor but the area is rich in culture and history with plenty of photographic opportunities. The road then passes Jetty Sungai Pinang Besar and completes the circle in Pangkor town. A note of caution: the winding turns and incline do not stop motorcyclists from driving at breakneck speeds, occasionally on the wrong side of the road. Drive with caution. Being just a short ferry ride from the mainland coastal town of Lumut, Pulau Pangkor is very popular as a weekend and holiday getaway for Malaysians; Lumut is an easy three- to four-hour drive or bus ride from Kuala Lumpur as well as Penang, and an even shorter distance from Ipoh. If you’re looking for a sleepy beach break, aim for weekdays. Public and school holidays can also be very busy. Although October to April is considered Pangkor’s rainy season, rainfall is generally not an all-day affair, allowing for plenty of sunny skies in between. 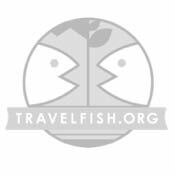 Use the above map to find specific destinations in and around Pangkor Island which are listed on Travelfish. Bed icons indicate a guesthouse, hostel or hotel, the knife and fork is an eatery or bar and the four-way circular thingy marks sights, attractions and other points of interest. Click on any icon for a short pop-up and a direct link to the page for that spot. If you are in the area, use the teardrop icon near the top left to show your position on the map (you'll need to allow position sharing for this last feature to work).